Ensuring a property is protected at all times, is one of the most efficient methods of security protection, particularly from the outside. Pyronix offers a number of perimeter protection options, including the XDL12TT-WE wireless external detector; offering a robust and reliable 24/7 solution. The XDL12TT-WE provides accuracy in all weather conditions, with its weatherproof IP55 rating and Anti-Sway Analytics for windy climates and swaying trees. The external detector features a range of up to 12m, Dual-Vision Pet Immune detection technology to offer extensive coverage while reducing the risk of false alarms. Installation of the XDL12TT-WE is straightforward and entirely flexible too; ranging from the varying mounting options which deliver the perfect angle and coverage, to the fixed bracket which allows 2 units to be fitted back-to-back; providing a wider 24m range, with 180° volumetric coverage. The XDL12TT-WE also features multi-award-winning two-way wireless technology to offer a whole host of easy and efficient installation benefits. Alongside this, the detector features three different frequency bands, avoiding any cross interference with nearby devices using the same frequency. The XDL12TT-WE can also be linked with Pyronix’ ProControl+ smart phone app. This offers another great way for users to keep up to date with their property’s security, whilst on-the-go. By programming the XDL12TT-WE as a switcher zone in the panel, rather than activate an alarm condition when set, it can offer 24/7 protection so that when activated, it will generate a real-time voice push notification via ProControl+ that the perimeter has been breached. This early warning of a possible intruder can be vital in enabling users to avoid a potential break-in. Furthermore, if the Outdoor Wi-Fi Mini Dome camera is installed in vicinity to the detector, the user can access real-time and recorded Full-HD video, offering visual verification of any activity. Having verified the activity, they can then take appropriate action. 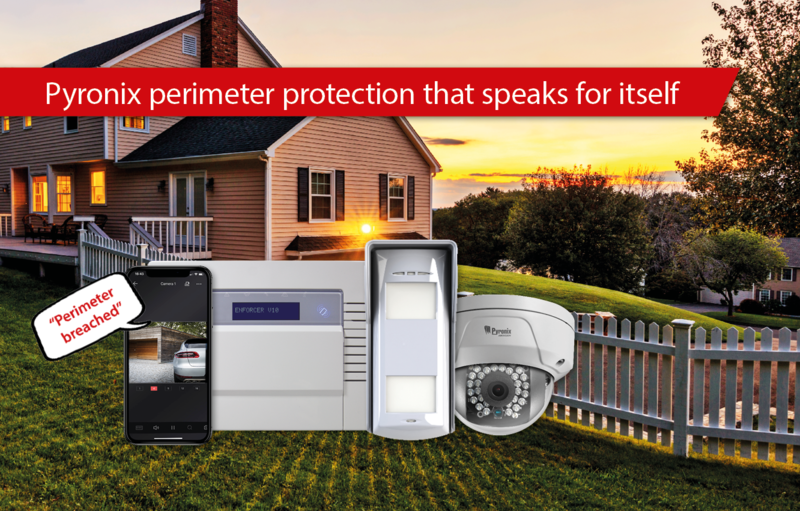 The flexibility and connectivity of Pyronix’s perimeter protection solutions, ensures great functionality and awareness, with a security system that can be relied on. Verified Perimeter Protection that speaks for itself.